Created with plant-based materials, the filter removes water toxins like chlorine, mercury, and copper. Hydration has never looked so good. Sustainability meets style in this 80-ounce (that's 10 cups worth) filter and pitcher, made from shatterproof, BPA-free plastic and finished with a white oak handle. The filter, created with 60% plant-based, renewable materials, removes common toxins like chlorine, mercury, and copper from your water, and the lid on top automatically opens when you hold the pitcher under the faucet. It's easy, it's nice to look at, oh, and get this—it gives back. For every filter purchased, our fellow B Corp Full Circle Home makes a donation to charity:water, an organization committed to bringing safe drinking water to communities in need all over the world. Now that's a win-win-win. Made in China. Named for their philosophy that “a product’s life cycle should be cyclical, rather than linear,” the New York City-based company makes their goods using sustainable, recyclable materials and creates them to have long, functional lives. A B Corp since 2013, Full Circle takes an active role in making sure their suppliers and manufacturers maintain high standards when it comes to social and environmental sustainability. They visit their factories, design with the environment in mind, and believe in constantly striving to do better. Soak your new filter laying flat in cold water for 15 minutes. Rinse it under running water for 10 seconds. Align filter and push firmly into place in your Carafe. Put the lid back on. Glass carafe, reservoir, and lid are dishwasher safe (lid on top rack). Remove silicone ring and filter before washing. I was looking for a new water filter that wasn't the typical visual monstrosities. 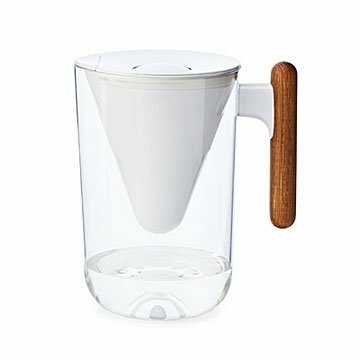 This filter/pitcher inspires me to drink more water when I open the refrigerator and see it. I purchased extra filters because I am looking forward to using quite a bit. The handle is real wood and is given instructions to avoid getting it wet, but it's a water pitcher...so...you won't be able to avoid some water contact. They suggest you rub oil on it once a month.